In many cases, endocytosis is not believed to play a primary role in mediating rapid desensitization of GPCRs, although the precise role of endocytosis in this process may depend on receptor expression level. Endocytosis of ^-opioid peptide (MOP) receptors does not contribute significantly to functional desensitization in cells expressing relatively high levels of receptor protein but does appear to cause desensitization in cells expressing lower levels of receptor (26). Studies of the P2-AR emphasize that GRK/arrestin-dependent uncoupling of receptor from G protein occurs in the plasma membrane before endocytosis begins, and desensitization of the P2-AR is not prevented by blockade of receptor endocytosis (27). Fig. 1. Examples of events controlling the membrane trafficking of GPCRs. In the endocytic pathway, agonist-activated GPCRs can be endocytosed via clathrin-coated pits, followed by sorting to lysosomes or recycling to the plasma membrane. 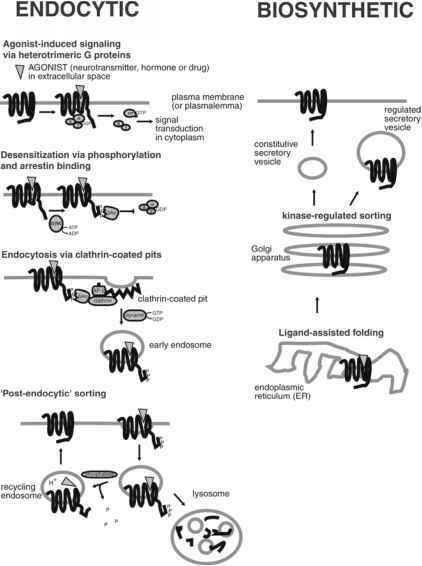 In the biosynthetic pathway, GPCRs synthesized in the endoplasmic reticulum can undergo ligand-assisted folding followed by kinase regulated sorting to either constitutive or regulated secretory vesicles. In contrast to its limited role in mediating rapid desensitization, endocy-tosis of certain GPCRs is believed to play a major role in mediating the distinct process of receptor resensitization (28,29). The reason for this major role is believed to be that endocytosis brings receptors in close proximity to an endosome-associated phosphatase, which mediates dephosphorylation of receptors previously phosphorylated (hence, "desensitized") at the cell surface. Dephosphorylated receptors are then recycled back to the plasma membrane in a "resensitized" state, which is fully functional to mediate subsequent rounds of signal transduction upon re-exposure to agonist (3,27). 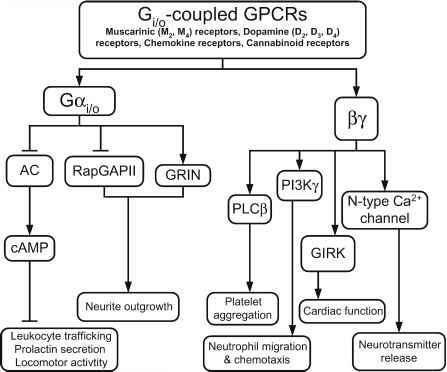 A similar role of endocytic trafficking in promoting functional desensitization has been described for other GPCRs, such as the MOP receptor (30), although this may not be the case for all GPCRs (3). Endocytosis is also believed to play an important role in mediating downregulation of many GPCRs by promoting proteolysis of receptors. Although downregulation of GPCRs can occur via multiple mechanisms (31), one mechanism involves endocytosis of receptors followed by membrane trafficking to lysosomes. GPCRs can be targeted to lysosomes after initial endocytosis by clathrin-coated pits or alternate mechanism(s) of en-docytosis (32,33). Certain GPCRs efficiently recycle to the plasma membrane following endocytosis, whereas other GPCRs are sorted preferentially to lysosomes (34,35). The sorting decision between tha plasma membrane and lysosomes is important because it can determine whether agonist-induced endocytosis promotes the distinct functional consequences of receptor resensitization or downregulation, respectively.